After undergoing a pair of interwar reconstructions, HIJMS Nagato served as the flagship of the Combined Fleet until the commissioning of the battleship HIJMS Yamato. Admiral Isoruku Yammomoto gave the final order to attack Pearl Harbor from the bridge of Nagato, even though the ship did not participate in the task force that launched the raid. Nagato served in, and survived, most of the important battles of World War II, with the exception of the Guadalcanal campaign. Because of her symbolic role in the Pearl Harbor attack, the USN made a special effort to find and destroy Nagato in the last months of the war. The Japanese successfully camouflaged the ship, however, and it survived the huge air raids that sank the rest of the surviving battleships of the IJN. Nagato was on hand for the Japanese surrender on September 2, 1945. As the U.S. fleet entered Tokyo Bay, some officers worried that fanatics aboard Nagato might take the opportunity to fire a suicidal last salvo. Relations remained peaceful, however, and Nagato was surrendered to American control after a brief scuffle over lowering the IJN flag. Nagato was far too old to serve usefully in the United States Navy, which had a surplus of aging battleships. The United States wanted to ensure, however, that the ship would not become a focus for revanchist Japanese nationalism in the future. Like many ships seized from Germany and Japan, along with a fair portion of the older cohort of USN ships, Nagato would meet her end at the Bikini atom bomb tests. The USN used the Bikini tests to understand the impact of atomic weapon strikes on fleet concentrations. The Navy used a variety of older capital ships and support vessels, including battleships, carriers, cruisers, and smaller ships. Many of the ships allocated to the tests survived, often for later use as targets for more conventional explosives. Nagato did not. In early 1946 an American crew took possession of the battleship, and worked her up sufficiently to get underway towards Bikini Atoll. Nagato’s condition was poor before the tests began, as age, battle damage, and poor maintenance had resulted in leakage and seaworthiness issues en route to the testing area. Nevertheless, she survived the first test (Test Able) on July 1, 1946. 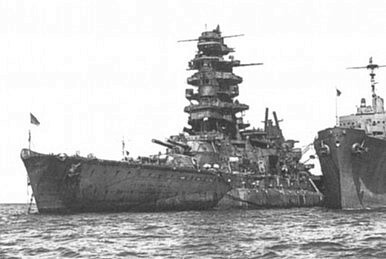 The second test, on July 25, left Nagato with a list that worsened over the course of a week, until she capsized and sank. Thus Nagato, like the war and Japan’s dreams of empire, ended with a nuclear explosion. A more considered policy might have taken Nagato as a prize, and left her in Pearl Harbor, near the USS Arizona Memorial, where she likely never would have become a focal point for Japanese nationalism. On the other hand, battleships and memories of empire may both be best left at the bottom of the sea. Robert Farley is author of The Battleship Book.